This is a good offer which I am sure will be popular especially as it is not restricted to the new Ugobus services like the previous weeks offer was. Most fares on First services in Devon and Cornwall will change by 5p or 10p as from Sunday 25th October 2009. This does seem a bit of bad timing with the new routes having just been launched. There is already a difference between Citybus and First in the city and this will just get a little bigger, until Citybus have their next increase at least. It will be interesting to see how the passenger loadings fare next week on the new routes when the normal fares kick in. I have seen a note tonight which suggests that yesterday was the last day in service for E215/6BTA the wonderful Volvo Citybus double deckers which have served Plymouth so well. It seems that they are being converted to open top, which if true, will at least mean they will last a while longer and wont just be scrapped just yet. E216BTA seen back in October 2006, it still looks pretty smart. One of these two is usually on the Estover school run which I see each morning as I leave for work. Shortly after this posting goes live I will see what has replaced it. I guess one of the K-LAE batch of Olympians which have been transferred from Bristol. Sad to see these go, the only buses to rival the Lynxes in high speed, hold on tight teeth chattering thrills when they ran between Roborough and Yelverton..
First D and C fares will Not be going up in Plymouth only the rest of Devon and Cornwall. 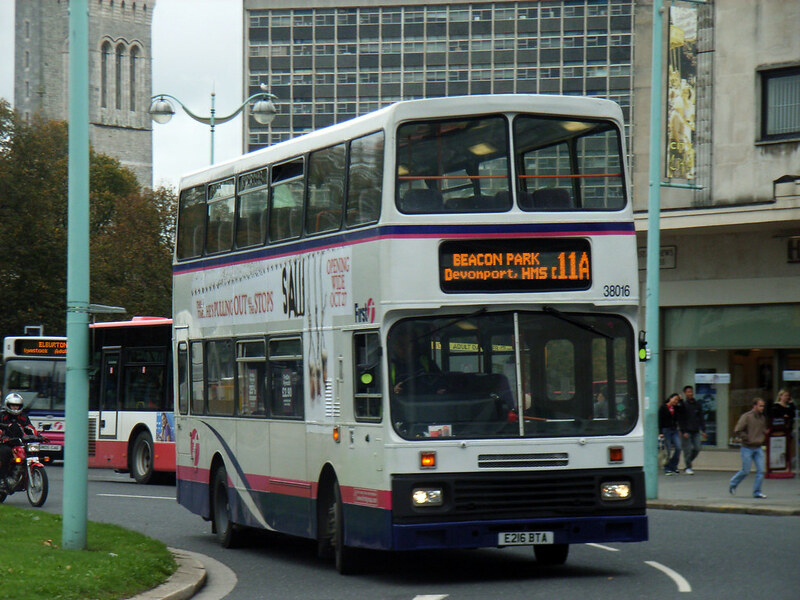 First fares in Plymouth have dropped quite considerably in the last few weeks, to the same as Citybus. Thanks anon for the fares update., The web site is a bit vague to say the least "some fares on some routes..." I still thought the fares were higher than Citybus even on the new routes. Still, any decrease is welcome! First Fares Have Gone Uo.